Sounds like you had a great weekend! It has been so humid and hot here in Ohio! You walk outside and melt! I am so thankful for my A/C! I love her little apartment! I don't think I'd survive summer without A/C! In Arizona, I don't think anyone would. Thanks for your comment, Christy. We did have a wonderful trip, but it's good to be home again. Ha ha! I will never look at cactus the same way (flipping me off). Glad you had fun. I bet Arizona was hot, because it was hot in Boise last week (my van said 118 at one point--although that wasn't official temps). When I lived in Vegas, the car temps were always at least 10 degrees hotter than the official temperature, so yikes! Glad you survived. Now I'm in my air conditioned home and wearing a sweater! That's how I enjoy summer! Occasionally I go sit in the sun and bask for a while, then retreat back inside to the A/C. I'm such a wimp. For some reason, I enjoy the dry Vegas heat though. At least every time I've visited I have. When I mentioned my take on what a cactus looks like to my sister, she said that it's a common saying in Arizona. Didn't know that, but I'm glad to hear I'm not the only one who thought of it! Good to hear from you, Charissa! The cactus are quite fascinating. I'm glad you have that memory of your foster mom. My sister has cactus in her front yard and they also have huge flowers that bloom in the morning, then die. Such an amazing plant! I need sun too, just not blazing hot sun! Hope your weather clears up quickly! Thanks for your comment, Linda! Hope you're doing well. Great post. Flipping off. I love that. The sign of a great vacations is coming home to rest. Congrats on the oodles of downloads! So true, Sherry. It's great to come home and rest after a fun vacation, filled with wonderful memories. 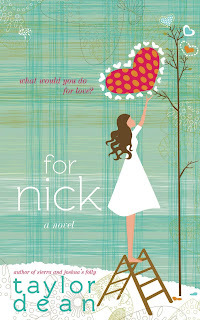 Thanks for helping me share the word about the free promotion of For Nick. You helped me get all those oodles of downloads and I appreciate it!